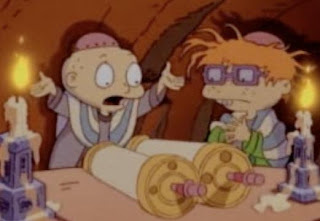 I loved the Rugrats as a kid, and I always enjoyed that they had holiday specials for the Jewish holidays. While the Passover special is by far the best, the Rugrats gave us a quick synopsis of the Hanukkah/Chanukah story in an adorable NickToons way. I mean... how can you say no to babies in yarmulkes? !